Since the 1950s, scientific and engineering research has generated enormous progress toward forcing hydrogen atoms to fuse together in a self-sustaining reaction – as well as a small but demonstrable amount of fusion energy. Skeptics and proponents alike note the two most important remaining challenges: maintaining the reactions over long periods of time and devising a material structure to harness the fusion power for electricity. As fusion researchers at the Princeton Plasma Physics Lab, we know that realistically, the first commercial fusion power plant is still at least 25 years away. But the potential for its outsize benefits to arrive in the second half of this century means we must keep working. Major demonstrations of fusion’s feasibility can be accomplished earlier – and must, so that fusion power can be incorporated into planning for our energy future. Unlike other forms of electrical generation, such as solar, natural gas and nuclear fission, fusion cannot be developed in miniature and then be simply scaled up. The experimental steps are large and take time to build. But the problem of abundant, clean energy will be a major calling for humankind for the next century and beyond. It would be foolhardy not to exploit fully this most promising of energy sources. 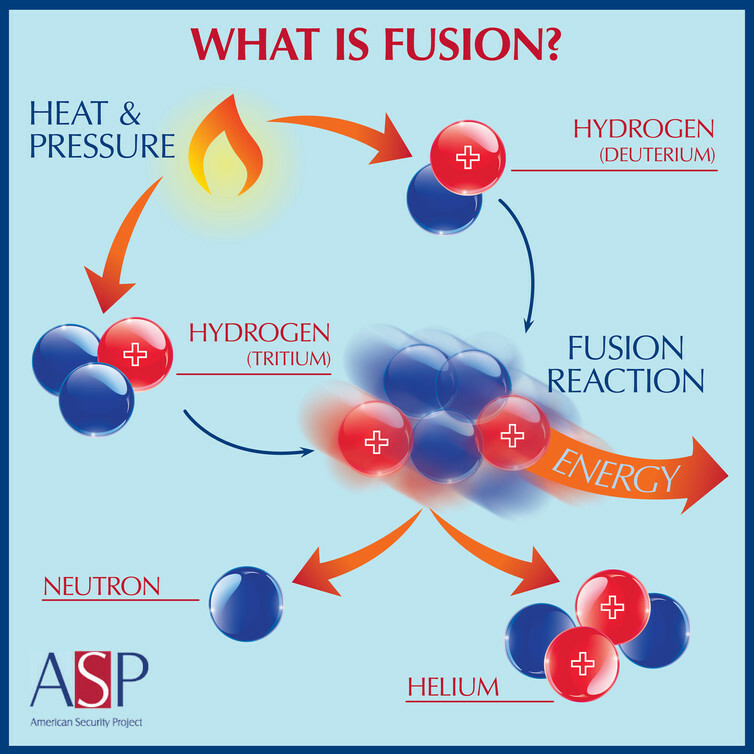 In fusion, two nuclei of the hydrogen atom (deuterium and tritium isotopes) fuse together. This is relatively difficult to do: Both nuclei are positively charged, and therefore repel each other. Only if they are moving extremely fast when they collide will they smash together, fuse and thereby release the energy we’re after. This happens naturally in the sun. Here on Earth, we use powerful magnets to contain an extremely hot gas of electrically charged deuterium and tritium nuclei and electrons. This hot, charged gas is called a plasma. The plasma is so hot – more than 100 million degrees Celsius – that the positively charged nuclei move fast enough to overcome their electrical repulsion and fuse. When the nuclei fuse, they form two energetic particles – an alpha particle (the nucleus of the helium atom) and a neutron. Heating the plasma to such a high temperature takes a large amount of energy – which must be put into the reactor before fusion can begin. But once it gets going, fusion has the potential to generate enough energy to maintain its own heat, allowing us to draw off excess heat to turn into usable electricity. 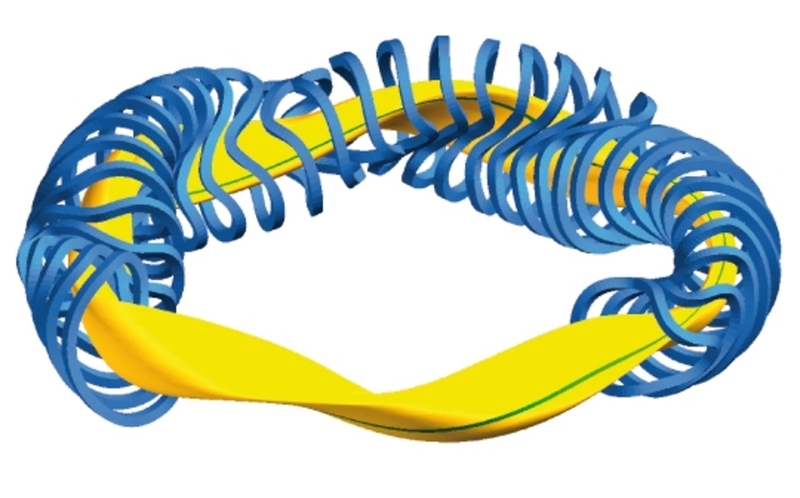 Fuel for fusion power is abundant in nature. Deuterium is plentiful in water, and the reactor itself can make tritium from lithium. And it is available to all nations, mostly independent of local natural resources. Fusion power is clean. It emits no greenhouse gases, and produces only helium and a neutron. It is safe. There is no possibility for a runaway reaction, like a nuclear-fission “meltdown.” Rather, if there is any malfunction, the plasma cools, and the fusion reactions cease. All these attributes have motivated research for decades, and have become even more attractive over time. But the positives are matched by the significant scientific challenge of fusion. The progress in fusion can be measured in two ways. The first is the tremendous advance in basic understanding of high-temperature plasmas. Scientists had to develop a new field of physics – plasma physics – to conceive of methods to confine the plasma in strong magnetic fields, and then evolve the abilities to heat, stabilize, control turbulence in and measure the properties of the superhot plasma. Related technology has also progressed enormously. We have pushed the frontiers in magnets, and electromagnetic wave sources and particle beams to contain and heat the plasma. We have also developed techniques so that materials can withstand the intense heat of the plasma in current experiments. It is easy to convey the practical metrics that track fusion’s march to commercialization. Chief among them is the fusion power that has been generated in the laboratory: Fusion power generation escalated from milliwatts for microseconds in the 1970s to 10 megawatts of fusion power (at the Princeton Plasma Physics Laboratory) and 16 megawatts for one second (at the Joint European Torus in England) in the 1990s. Now the international scientific community is working in unity to construct a massive fusion research facility in France. Called ITER (Latin for “the way”), this plant will generate about 500 megawatts of thermal fusion power for about eight minutes at a time. If this power were converted to electricity, it could power about 150,000 homes. As an experiment, it will allow us to test key science and engineering issues in preparation for fusion power plants that will function continuously. ITER employs the design known as the “tokamak,” originally a Russian acronym. It involves a doughnut-shaped plasma, confined in a very strong magnetic field, which is partly created by electrical current that flows in the plasma itself. 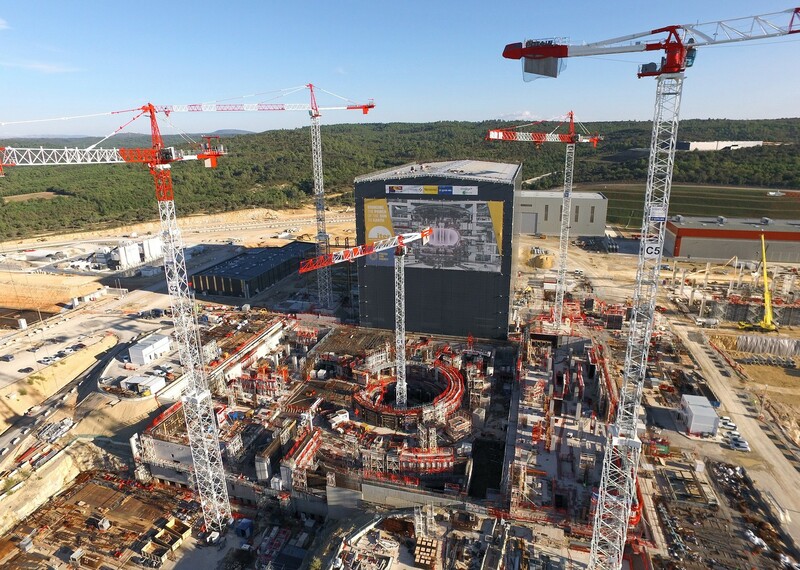 Though it is designed as a research project, and not intended to be a net producer of electric energy, ITER will produce 10 times more fusion energy than the 50 megawatts needed to heat the plasma. This is a huge scientific step, creating the first “burning plasma,” in which most of the energy used to heat the plasma comes from the fusion reaction itself. ITER is supported by governments representing half the world’s population: China, the European Union, India, Japan, Russia, South Korea and the U.S. It is a strong international statement about the need for, and promise of, fusion energy. From here, the remaining path toward fusion power has two components. First, we must continue research on the tokamak. This means advancing physics and engineering so that we can sustain the plasma in a steady state for months at a time. We will need to develop materials that can withstand an amount of heat equal to one-fifth the heat flux on the surface of the sun for long periods. And we must develop materials that will blanket the reactor core to absorb the neutrons and breed tritium. 1) Using computers, optimize fusion reactor designs within the constraints of physics and engineering. Beyond what humans can calculate, these optimized designs produce twisted doughnut shapes that are highly stable and can operate automatically for months on end. They are called “stellarators” in the fusion business. 2) Developing new high-temperature superconducting magnets that can be stronger and smaller than today’s best. That will allow us to build smaller, and likely cheaper, fusion reactors. 3) Using liquid metal, rather than a solid, as the material surrounding the plasma. Liquid metals do not break, offering a possible solution to the immense challenge how a surrounding material might behave when it contacts the plasma. 4) Building systems that contain doughnut-shaped plasmas with no hole in the center, forming a plasma shaped almost like a sphere. Some of these approaches could also function with a weaker magnetic field. These “compact tori” and “low-field” approaches also offer the possibility of reduced size and cost. Government-sponsored research programs around the world are at work on the elements of both components – and will result in findings that benefit all approaches to fusion energy (as well as our understanding of plasmas in the cosmos and industry). In the past 10 to 15 years, privately funded companies have also joined the effort, particularly in search of compact tori and low-field breakthroughs. Progress is coming and it will bring abundant, clean, safe energy with it.